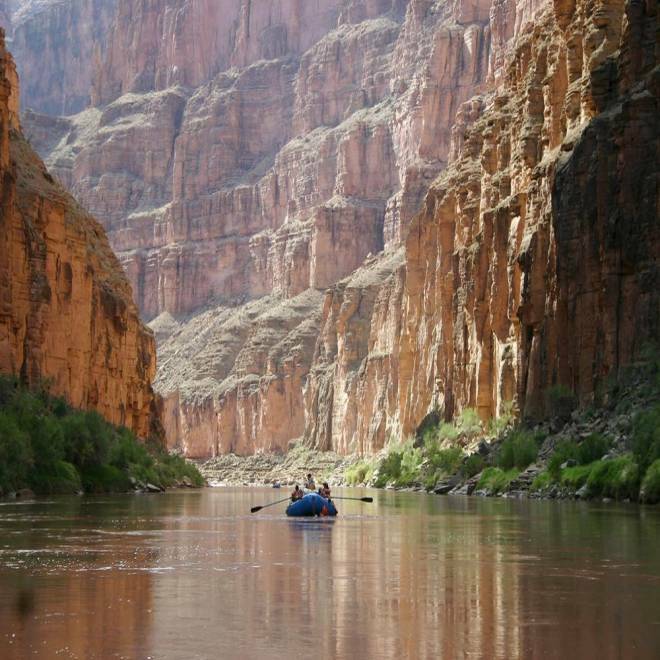 Boaters travel down the Colorado River in Grand Canyon National Park. When voters in Arizona go to the polls next month, they will be asked to decide a landownership tug of war: Should the Grand Canyon belong to all Americans, or just the residents of Arizona? A controversial ballot measure backed by Republicans in the state legislature is seeking sovereign control over millions of acres of federal land in the state, including the Grand Canyon. Proposition 120 would amend the state's constitution to declare Arizona's sovereignty and jurisdiction over the "air, water, public lands, minerals, wildlife and other natural resources within the state's boundaries." The measure is the latest salvo in the so-called "sagebrush revolt" by Republicans in the West aiming to take back control of major swaths of land owned by various federal agencies, much of it by the Interior Department's Bureau of Land Management. State Sen. Sylvia Allen, one of the Republican backers of the measure, argues that federal retention of the land hurts the economy of the Western states and leaves them struggling to fund public education, nurture their economies, and manage their forests and natural resources. "We do not have the ability in rural Arizona to provide jobs for our citizens due to the fact that the federal government controls all the land," Allen told Reuters. "It leaves us at a great disadvantage. We're not able to bring in industry and provide for the jobs that we need," she added. The exact area of public land targeted by the measure -- which excludes American Indian reservations and federal installations such as arsenals - was not immediately clear on the Arizona Secretary of State's website. The Sierra Club pegged the area at between 39,000 and 46,700 square miles -- or 34 percent to 41 percent of the entire state. The ballot measure is just the latest move in a decades-old federal-state skirmish over control of a wide range of natural resources in Western states, often pitting mining, drilling and logging companies against those seeking to protect the environment. The efforts have had mixed success. In May, Arizona's Republican Governor Jan Brewer vetoed a state bill calling on Washington to relinquish the title to 48,000 square miles, arguing that it created uncertainty for existing leaseholders on federal lands in difficult economic times. But similar legislation was signed into law by Governor Gary Herbert in neighboring Utah in March, despite warnings from state attorneys that it was likely unconstitutional and would trigger a costly and ultimately futile legal battle. Opponents of the latest drive to assert Arizona's ownership say that, if successful, the initiative could undermine protections provided by federal environmental laws such as the Clean Air Act, Endangered Species Act, and Clean Water Act, and would saddle Arizona with lands for which it would be unable to care. "They can't even fund and ensure that their (state) parks are protected, so how they would take on an additional 25 to 30 million acres of land is a big question mark," Sandy Bahr, director of the Sierra Club Grand Canyon Chapter, told Reuters. No polls have given a sense of whether Prop 120 will prosper during the November 6 election. But Bahr cautioned that, should it pass, it would inevitably trigger fresh litigation for Arizona, which recently fought a legal battle over its tough 2010 crackdown on illegal immigrants all the way to the U.S. Supreme Court. "This one is just blatantly unconstitutional," Bahr said of Prop 120. "Does Arizona really need another lawsuit?"